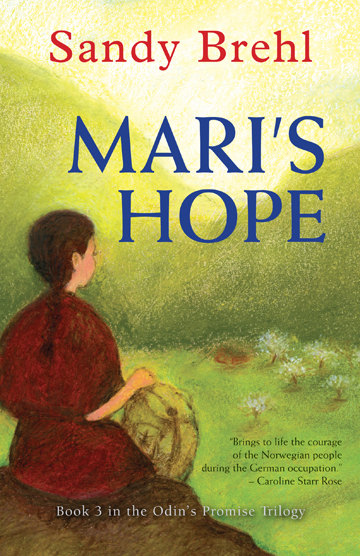 Mari’s Hope by Sandy Brehl. Crickhollow Books/Crispin Books, Milwaukee, WI 2017. Mari is on her way home one cold Norwegian night during the German Occupation of World War II. But it is not really her home anymore. German soldiers moved in over two years ago and Mari’s family lives instead in her grandmother’s small cottage next door. She is unsure what the “ruckus” she has just witnessed means, but it is just another incident in a long list of frightening dramas played out every day under German Occupation. As she enters the cottage and finds no one home she knows that her mother and grandmother are still in the main house cleaning up after the Germans evening meal. They often linger with their cleaning to glean useful information from overheard conversations between the soldiers. Her father, too, is not yet home. He undoubtedly stopped at the home of trusted contacts in the Resistance. For Mari’s part, she locks the door and takes out the forbidden radio that is always hidden. She will listen to the BBC broadcast. This is the Resistance in Occupied Norway. In Mari’s Hope, the third book of a trilogy, author Sandy Brehl has deftly managed to add mystery and suspense into a story whose historical conclusion we all know. The Occupation has made life hard in the town of Ytre Arna. Food and medical supplies are scarce. Mari’s fourteenth birthday is approaching but she knows there will be no possibility of a celebration. But there are surprises along the way. She takes on a secret mission which enables her to travel to Bergen, a large city where her sister and her husband live. And people who seemed to be one thing, she realizes, can also be another. Sometimes things are not what they seem. This novel, with its well written prose and suspenseful plot will keep lovers of historical fiction—of all ages—glued to the page. Sandy has two book release parties coming up: Boswell Books, 7:00 PM September 14 and October 1, 2:00 PM Hales Corner Library. SGL: For the benefit of readers who are new to this trilogy, what inspired you to write about the occupation of Norway during WWII? SB: First, I’m not Norwegian, but I visited the little village near the west coast of Norway with a friend who was traveling there to meet her own first- and second- generation relatives. That was DECADES ago, but it was a revelation to me! I love the country. I was amazed to learn stories of the German occupation during World War II from those who had lived through those years. I returned home convinced that I should write stories about that time and place; trying to capture the resistance spirit of the people I now call friends. SGL: Have you been writing all your life? When did you start writing seriously, for publication? SB: I’ve been writing my whole life, starting with crayon scribbles in the few books my family owned. (Practicing for book signing?) I grew up in a family of storytellers and proficient-but-functional writers. “In my day”, as old-timers say, creative writing rarely found a place in schools. So I learned all about “writing” correctly, and used those skills competently, but I had little experience with writing stories. Nor did I keep a journal. Any storytelling I did was oral, except for the few times when such a thing was “assigned”. In those cases my paper earned good marks, but also included a comment that I was a “good storyteller”. Those encouragements came back to me eventually. When I began teaching I realized the power a teacher has to provide opportunities to write creatively, to write on topics of choice, to encourage and provide specific praise. The impact of directly stating, “You’re a good writer,” or “You tell stories well,” or even, “What a writer!” is beyond measure, and I tried to reinforce those messages to students as often as possible. I wrote WITH and FOR my classes for years, but never considered submitting anything to publish until I had a fender bender one fall. I wrote the full story of that on a blog post. The learning curve from there to publication was steep and far from smooth. From that time on I viewed myself as a “pre-published” writer. SGL: What is your writing/creative process? Do you outline first? SB: My process is as messy as my desktop and files. For longer works, I work in my head first and longest. Throughout the process I am writing notes and passages, but not actually drafting. Historical and well-researched pieces like this trilogy require extensive notes and I have books stuffed with sticky tabs from which timelines and significant event chronologies emerge. As my critique partners often remind me, this can lead to falling into a “teacher voice” in the writing. I always have a plan, but am not devoted to it. I have stacks of notes and webs and chapter tags in spiral notebooks, but none of it would make sense to anyone else. Once the drafting and revising are underway, the notes rarely make sense even to me. When writing picture book text, poetry, and other short pieces I never work from notes, but I do work by hand rather than on a keyboard. Only when I have the writing pretty solidly in place do I move to the computer to work on various refinements and save multiple versions where I can find them. SB: With Odin’s Promise, it was lucky, really, that I’d written so MANY versions and approaches over time. None of them had managed to take control of the stories effectively, but I liked them very much and they did have things to say and do. Once I found my main character I had an entire supporting cast waiting in the wings to take on new roles. Mari came about as a direct result of research. While reading journal entries written by young people during the occupation, Mari walked in the door, sat at my side, and redirected the many different characters, events, and issues from her point of view. In the process she made MY stories HERS, arriving as a fully formed character who jabbed her elbow in my ribs whenever I wavered from the story she needed to tell. It wasn’t until the prospect of writing a sequel that I needed to chart Mari’s personal development over time, then merge it with the timeline of historical events and changing conditions. As for Goatman, giving derogatory nicknames to various Germans was yet another way for the loyal locals to demonstrate their resistance to and contempt for the occupiers, mocking them behind their backs. I consciously worked at humanizing “the enemy” from the beginning, portraying the German soldiers and occupiers as individuals with various motivations, backgrounds, and personalities. Readers (young and old) often comment on that aspect of the story. As the occupation stretched out over the years, all pretenses of Germans being there as “protectors” disappeared. Goatman became a symbol of a complex soldier, one who was neither kindly nor evil, but simply self-serving and surviving. Mari needed to have an antagonist who personified the most base aspects of an “enemy” while portraying a distinctly individual personality, one who was irritating and offensive to the other soldiers, too. The last thing in the world I wanted readers to take away is that “ALL” Germans (or anyone) should be viewed as monolithic stereotypes. Each of the characters became very real to me, growing more so with each revision and extension of the stories. I feel like I would recognize them if I met them on the street and I’d want to ask them what they’ve been up to. It’s very gratifying to hear from readers who seem to feel the same way. SB: I tend to switch gears. Sometimes it’s physical activity, like gardening or walking the dog. Sometimes I just stop, save, and get busy with household chores, errands, etc. I spend an hour on the treadmill every morning followed by thirty minutes of physical therapy exercises. That’s when the characters are likely to return, often uninvited. They initiate internal conversations with me, often pretty opinionated ones. SGL: You manage to keep the suspense going and even add a little mystery in this third book. Assuming readers all know how WWII turned out, how did you manage to do this? Do you read mysteries? SB: You’ve pointed out the biggest challenge of all, and one that was an early talking point with my editor. We considered approaching the final book as a full flashback, acknowledging immediately that the war ended and Norway is free. I’m not a fan of flashback in general, and this felt very deflating to me. Once again research gave me a structure and insight to get started. Germany had never declared war on Norway. The occupation/invasion was described as a protective move, “saving” Norway from the Allies. That lie quickly dissipated, but the Germans remained in Norway with no official declaration of war, increasing their presence every year. After the Allies began making headway against the Axis forces, in North Africa, in Italy, and finally in France and beyond, the free world began feeling hope, seeing a light at the end of the tunnel. In Norway, though, there was lingering doubt that an official peace would affect them. The occupying German forces in Norway steadily increased until the final days, suggesting that defeat in Europe might lead to a “last stand” in Norway, making it the fortress in the north that Hitler so often claimed. That reality added some significant tension to Mari’s life even though the Allies would have come to help, the war might just be starting for Norway once the peace treaty was signed. Mari’s more personal, direct challenges during those remaining years, even mysteries and threats, were essential to make this a novel, not a dissertation. I do sometimes read mysteries, but not often. Those details and situations emerged from the characters’ imagined development, from anecdotal stories told to me by survivors, and from researching biographies of individuals. I’m pleased to have you feel that continual tension. SGL: When you were writing Mari’s Hope did you have concerns that this book wouldn’t live up to the other two? SB: YES! Concern, anxiety, and stress. First I tried writing a single sequel to Odin’s Promise and realized that it needed to be two separate novels to reveal changing conditions, historical events, and Mari’s development over such a long span of time. That meant I had a skeletal version of the “final book” written when the middle book, Bjorn’s Gift, released. Mari’s Hope required many revisions to account for changes in the second novel, but my very skilled editor, Philip Martin, had confirmed that the bones of the final novel were effective. In fact, he initially insisted on me writing both books before offering a contract on a trilogy. Every reader who responds with interest and satisfaction after reading the final book gets a huge sigh of relief from me along with my thanks. SGL: What’s next? Do you have another book in the works? You mentioned that you have worked on creating picture books. SB: Writing picture books is my first love, and early on I envisioned writing bits of the war year stories as a picture book. At that time, some picture books were for older readers and had much more extensive text. Even so, my journey just goes to show how little I knew at the time about finding the right format and genre for the right audience and the right story ideas. Since then I’ve worked hard and learned much about what it takes to write a really good picture book. I have several manuscripts polished and out on submission while continuing to take workshops, courses, work with critique partners, and WRITE. I also have works in progress for middle grades, including a novel in verse and a contemporary with a fifth grade boy as the main character. SGL: Your books deal with very serious issues. When you visit schools, how do you talk to kids about the themes in your books? How does a typical school visit play out? SB: My school visits are often scheduled by teachers with content in mind, aiming to extend and explore works of historical fiction and my book specifically. Several schools have invited me to return year after year, which is a great honor. At school visits spanning many grades I focus on writers being real people, about the need to get ideas onto paper and then treat those ideas as seeds. Revising is a way of feeding, weeding, watering, and working on those seeds to eventually harvest as fully developed stories, poems, or other content. I also share picture books with the youngest students, books that relate to the writing process and to being brave and honest. Many thanks to Sandy for spending time with me and answering my questions so thoughtfully. I have interviewed Sandy before; the links to those interviews are here. Sandy Brehl is the award-winning author of a Norway historical trilogy for ages ten-thru-adult. (Odin’s Promise, Bjorn’s Gift and Mari’s Hope.) She also writes a blog about picture books (http://Unpackingpicturebookpower.blogspot.com) and contributes to a blog about historical works from middle grade readers (https://thestoriedpast.org). She’s an active member and volunteer with SCBWI-Wisconsin. 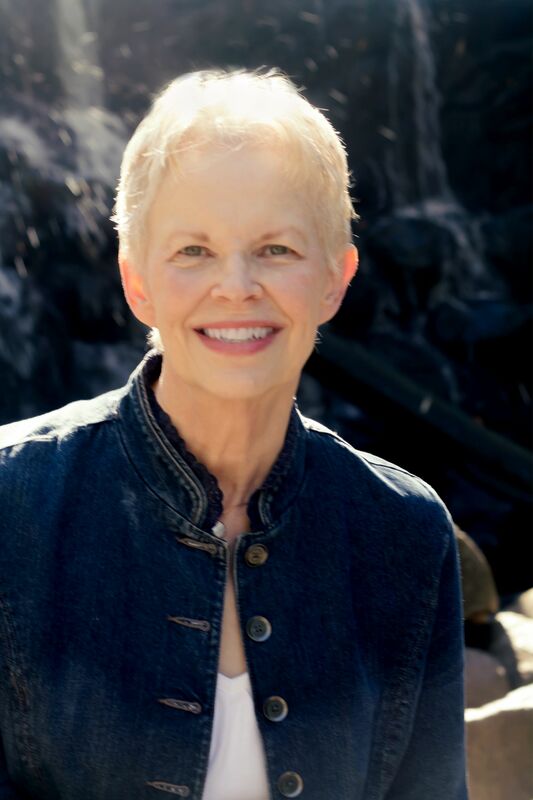 Sandy writes fiction, nonfiction, and poetry for young readers of any age. A retired educator living in the Milwaukee area, Sandy offers programs for schools, libraries, and adult groups. Learn more at http://www.SandyBrehl.com, follow on Twitter @SandyBrehl and @PBWorkshop, and on Facebook: Sandy Brehl Author. Check out the next two reviews on the Blog Tour!